Suellen Murray, BPR, LLB, loved the Halifax Public Gardens and walked through on her way to work in the Department of Health each day. It had particular meaning and joy for her during the three years after her diagnosis of a brain tumour. In 2014, Dr T.J. (Jock) and Janet Murray, Suellen’s parents, and her husband, Byron Rafuse, established a bursary to recognise her love of the Gardens and to encourage and support educational activities related to this very special space in our city. Many of Suellen’s friends and colleagues have already contributed to the fund. The general public is also invited to make a donation. An income tax receipt will be issued. Funds are invested by The Friends of The Public Gardens. Please follow the guidelines for submission and deadlines as noted. (a sub-committee of the Board, The Friends of The Public Gardens) and the Murray family. 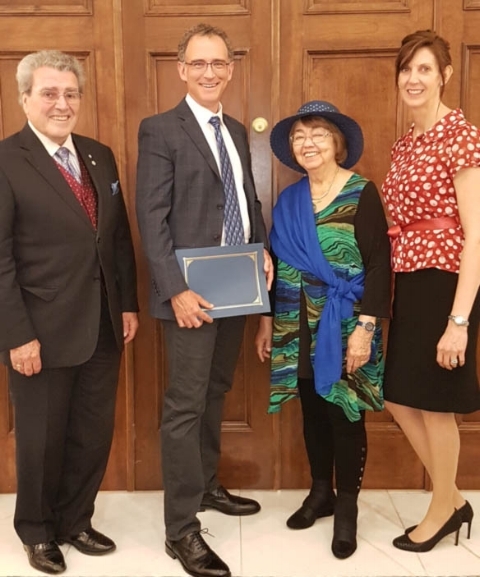 Dr. Jock and Janet Murray made the bursary presentation to Dr. Fowler at the Victoria Day Tea on Monday, May 21, 2018. The recipient of the 2018 Suellen Murray Educational Bursary is Dr. Jonathan Fowler. Dr. Fowler, an archaeologist at Saint Mary’s University, Halifax, is well known for his historical archaeological work, especially over the past number of years at Grand Pre in the Annapolis Valley. His bursary project Public Gardens Archaeological Survey will use geophysical survey methods to detect and map the ruins of a rink operated in the Gardens ca. 1860 – 1890. Dr. Fowler wrote in his proposal “this structure is said to have been the first covered skating rink in what would become Canada, and constitutes a significant and understudied heritage resource in the Public Gardens”. Dr. Fowler will conduct his on-site research over in the summer. Once complete, the surveyed map of the old rink’s foundations will be available to the Friends of the Public Gardens, to HRM, and to the Province of NS. 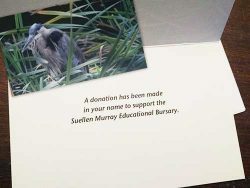 Donate so the Suellen Murray Educational Bursary will continue to support projects which benefit the Public Gardens, as well as the young professionals, students and citizens who receive it. The recipient of the 2017 Suellen Murray Education Bursary was Dr. Claire Halstead. Dr. Halstead is a graduate of the University of Western Ontario with a PhD in History. The Bursary Selection Committee was intrigued with her proposal entitled “150 Years as the Heart of Halifax: A Study on Public Engagement and the Halifax Public Gardens” and especially its relevance to the Gardens in its 150th anniversary year. People were asked to share stories, memories and photographs with her in multiple ways over the summer of 2017. Many of you may have seen the clothesline strung across the inside of Horticultural Hall. People of all ages took advantage of this particular method to write and share precious memories and reflections on the Gardens and the impact it had on their lives. From those shared stories and archival research, Claire has produced an interesting, insightful report which will be shared with Friends and the general public in the new year. 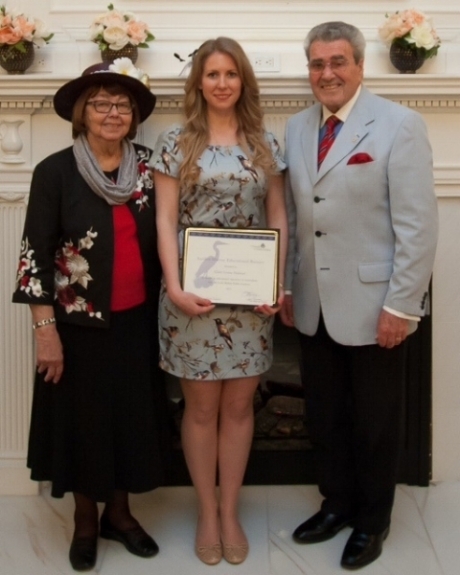 The first recipient of the Suellen Murray Educational Bursary was Amy Soosaar-Joseph. Five Dahlias won first place in the open competition for all of North America: Hollyhill Blackwidow, Cornel, Ivanetti, Tiny Treasure and Camano Puff. sent it around to family and friends. 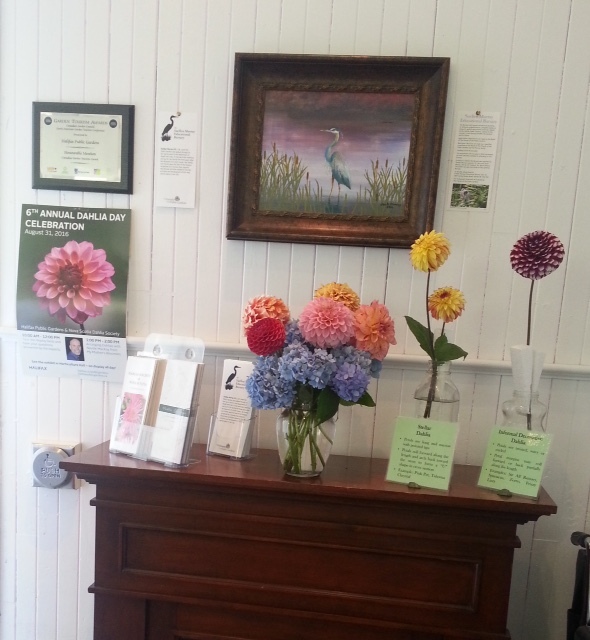 On August 26, 2015, the first bursary was awarded during the 5th annual Dahlia Day celebrations. In announcing the winner of the bursary, Suellen’s mother, Janet Murray, mentioned the incident of the Great Blue Heron. The head gardener then rose to say that the heron had returned to the Gardens that very day. The heron has taken on a special meaning for Suellen’s family and friends, and has been chosen as the logo for the bursary. 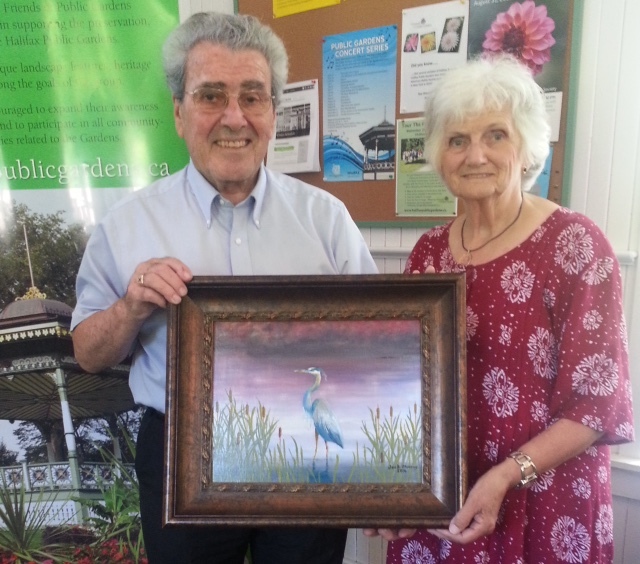 a painting he had done of the blue heron. “The Blue Heron” hangs in Horticultural Hall in The Public Gardens.